Fernando Torres, Iker Casillas and Andres Iniesta of Spain leave the field at the end of their Group B match against Chile at Estadio Maracana. Over the past half-decade or so, the Spanish national team put together one of the most impressive runs in the history of international soccer, winning a European Football Championship in 2008, a World Cup in 2010, and another Euro crown in 2012. But in this year’s World Cup, Spain went out with a whimper — routed by the Dutch in its opening match and failing to muster a single goal in a 2-0 loss to Chile. Just like that, Spain’s hopes of advancing beyond the group stage were dashed. Before the tournament began, our World Cup prediction model had Spain racking up 5.9 points in the Group B table. (In round-robin play, teams get three points for a win and one for a draw.) But after two losses, Spain is now likely to amass only 2.2 points, 3.7 fewer than expected — a huge shortfall. As strange as it sounds, though, this isn’t an uncommon fate for defending World Cup champions. Since the tournament shifted to its current three-points-for-a-win format in 1994, defending champs have come up short of pre-tournament predictions by an average of 2.3 points during the group stage, and only two incumbent champs — Germany in 1994 and Brazil in 2006 — actually exceeded expectations the years they defended their titles. To determine these shortfalls for years before 2014 (tournaments for which I don’t have FiveThirtyEight projection data), I turned to the pre-tournament Elo ratings. The Elo system is designed to produce probabilities of wins and losses for each team in a matchup based on the difference between the two teams’ ratings. Of course, the group stage of the World Cup also allows for draws. 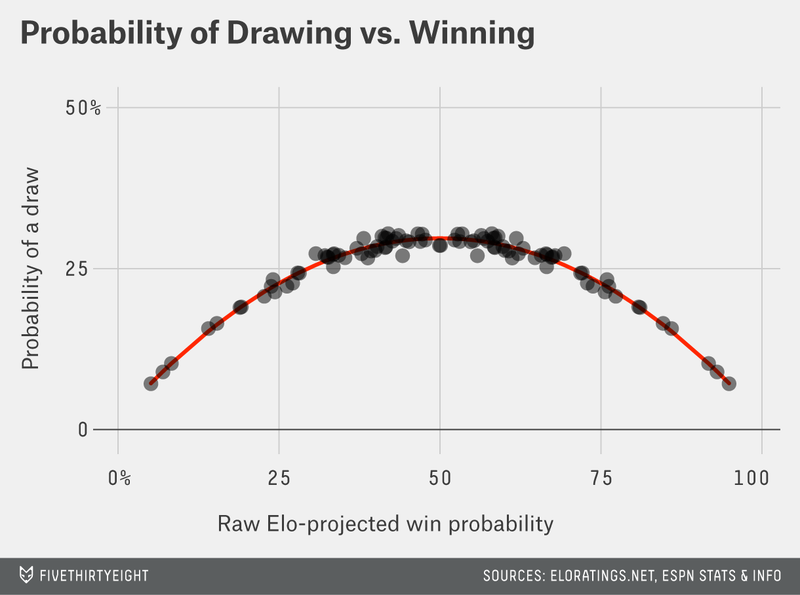 Elo treats draws as half a win for each team, but doesn’t provide a prediction for a tied outcome. So, I tapped into our FiveThirtyEight model to derive the probability of a draw based on the raw probability of a win if ties weren’t allowed. Only the 2006 Brazil side, which tore through the group stage undefeated, significantly outplayed expectations. The rest either played to them (Germany 1994), underperformed slightly but still advanced (Brazil 1998), or flamed out spectacularly (France 2002, Italy 2010 — and now Spain 2014). It’s not clear why this is happening. Is Elo overrating defending champions for some reason? Are these teams overburdened by the weight of expectations? Or is this just an unlucky streak in the small sample of six tournaments? Theories will abound, but one thing is for sure: When it comes to meeting pre-tournament expectations, it’s rarely paid to be a defending World Cup champion in recent years.